The social scene would have lost some of its colour without them. Their unmistakable glow stood them out at functions. When not walking hand in hand, they are never too far apart. Often found in the same circle of friends and enjoying similar interests, their unbroken bond of friendship propels their union. Meet the 'snail and its shell' couples of the year. These two are always on cue. Never setting a foot wrong, they have made it a family tradition to attend weddings, birthdays and soirees of any sort jointly, like conjoined twins will. While he loves to downplay his love for high street fashion, preferring subtle accessories, the same cannot be said of Nkiru who is at home with making bold fashion statements. With this pair, you would never go wrong in the love department and perhaps the fashion unit. 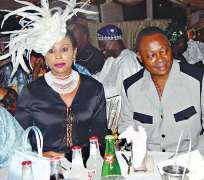 Going places together has become a favourite past time for the former first couple of Ekiti State. This year alone, they have attended more red carpet events than we can vividly recount. You go on, take a leap of faith on sighting the peculiar pair. They are mostly found at high octane grooves. Their confident poise ensures they are a must watch. The billionaire industrialist is at his best when he steps out at functions with Shade, his youngest wife, in tow. A lover of diamonds and other precious stones, her presence ups the ante for other similarly inclined couples. Eyes are trained on them knowingly or unknowingly. Nigeria's most celebrated beauty queen of all times alongside her medical doctor hubby are recipients of unsolicited attention wherever they go. Their combined efforts in the style department will make you go weak at the knees. Many a times, they have made the lily livered scamper to safety with their turbo charged arrival at functions, with Deola, a high ranking staff of Virgin Nigeria several miles ahead of her peers.